As you can tell, stunning and artful photography is the real back bone of Slam’d Magazine and bringing you the best of the best high quality content from around the globe is only made possible through our world class staff and their commitment to their craft. We wanted to do something special and honor our team of contributors and photographers who worked extremely hard in 2014 to hunt down the perfect rides, shoot locations, and eclectic mix of Slam’d from all genres, worldwide. We selected our Top 14 favorite photographs captured this year and we shared them through our Facebook Page as a countdown to the New Year. If you think we knocked it out of the park in 2014, just wait and see what we have in store for Twenty15! It’s going to be an amazing year, and we look forward to capturing even more badassery for your viewing pleasure. 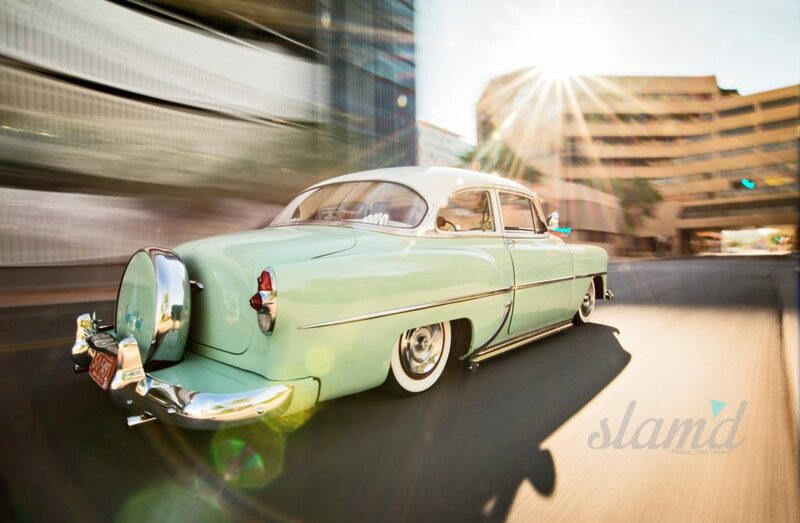 If you think your ride, shop, or photos have what it takes to be featured, shoot us an email at SlamdMag@gmail.com as we’re always on the hunt for quality content! 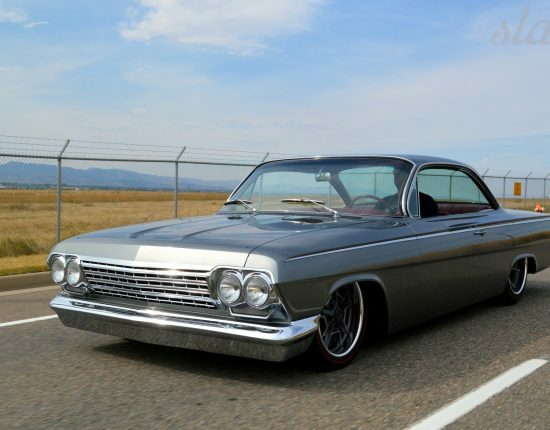 This car-to-car rolling shot matches the vehicle and title of the feature perfectly – keep it simple. 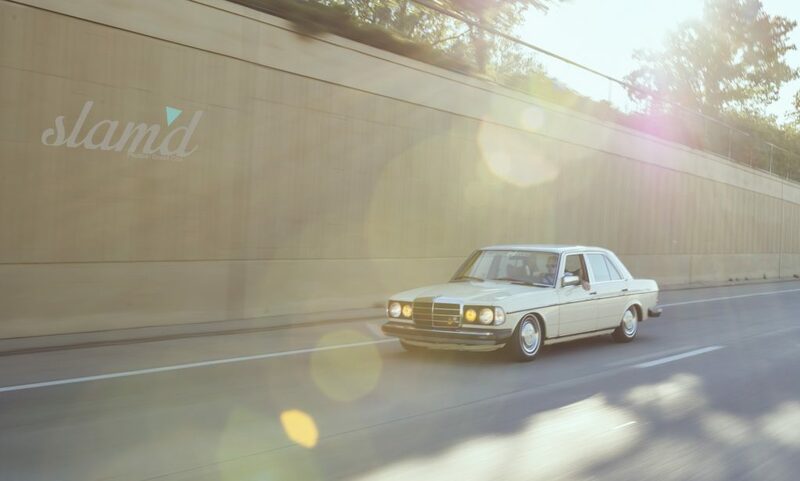 A clean and simple shot, shooting into the sun with minimal editing, helped Grant’s photo and Jon Hansen’s Mercedes land a spot in our Top 14 from 2014. 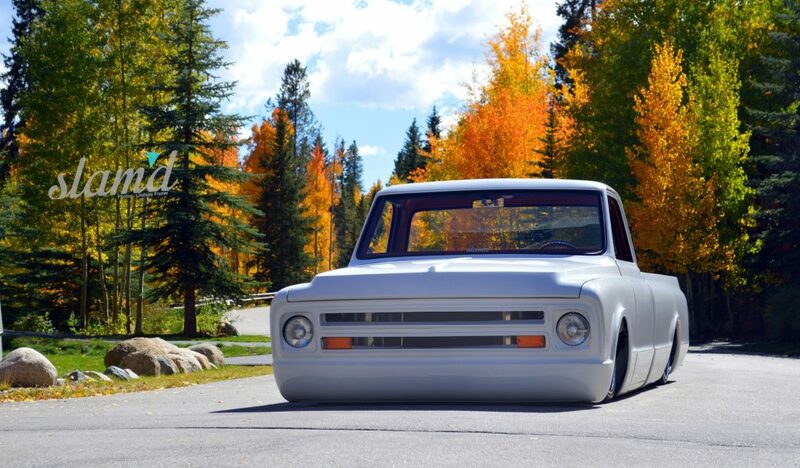 With the scenic backdrop of the changing seasons in Colorado, Lindsey Fisher captured Mike Partyka’s 1967 C10 with perfect natural beauty. The build itself also reflected a “season of change” for the owner, so this outdoor background played well helping to tell the story and added a bit of color to the super clean build. Rolling shots aren’t necessarily the easiest thing in the world of automotive photography, but to capture three low rolling classic Mercedes in one killer shot is definitely a feat! 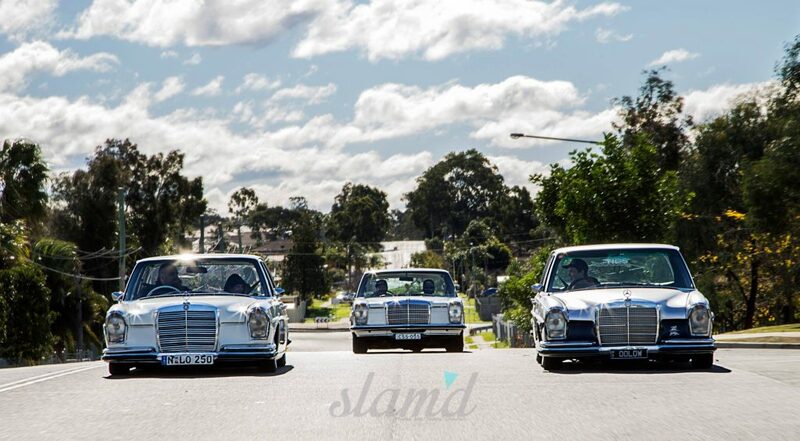 Toasty nailed it bringing to life these three very unique Benzes from the land Down Under. Multi car shoots always add a degree of difficulty but Toasty handled it like a pro, stay tuned for more from our Australia based photographer! Sean was instrumental in hunting down Pascal’s Ranger and scoring us the debut shoot for the cover of our Premiere Issue helping to launch Slam’d Mag off with a bang! This sunset shoot helped bring out the hard to capture color of The Stranger and the electrical industrial background fits well with the clean industrial style of this build. Sean even snuck in a short video clip for us, which anyone shooting at that “golden hour” knows just how hard that is, since the “hour” is really only like 15-30 mins max. Capturing such a menacing machine took the perfect location, such as this local dive bar, to really bring out the “rebel” attitude and style that goes along with this build. Steve Berndsen, our Canada based editor, shot the Misfits Metro on his road trip from Canada to Mexico (you can read about his adventure HERE) and delivered it just in time to make the debut issue. 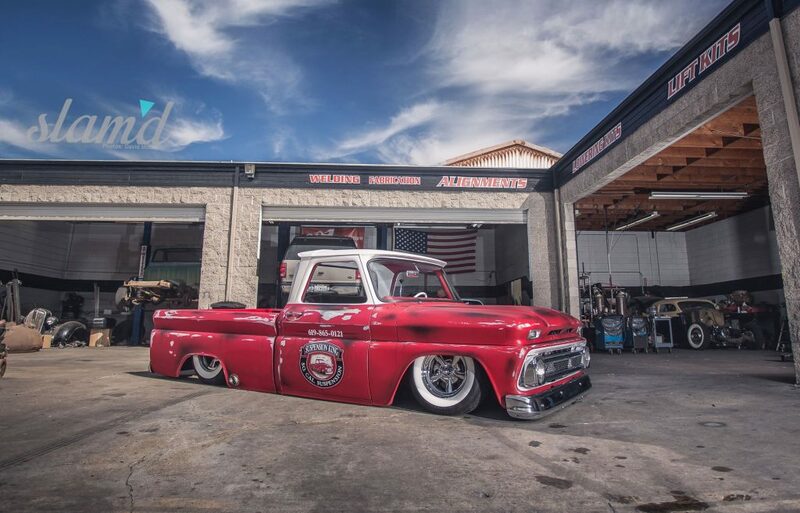 Another stellar shoot that came in just under the wire (ahhh good ol’ SEMA) was this on location shop shoot of the So Cal Suspension Shop Truck. 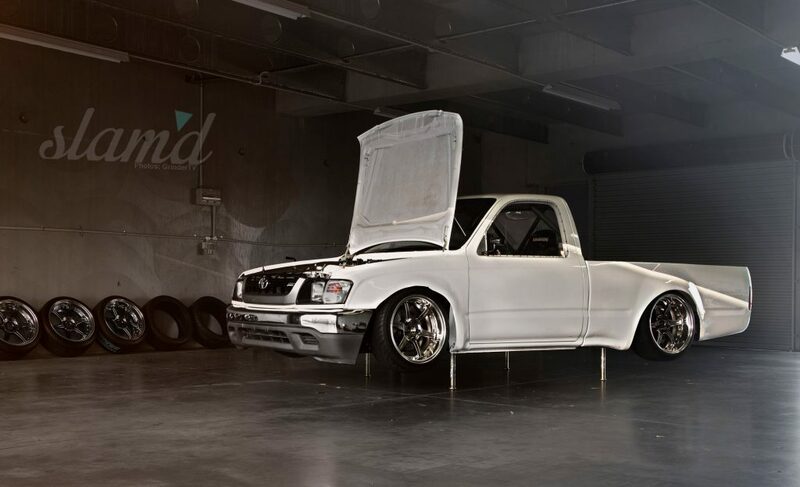 David Moore was able to balance the work environment that a “shop truck” belongs in, while still bringing out the exquisite detail that went into this one-of-a-kind build, and all with a tight deadline to shoot it before it was loaded up and headed to SEMA 2014. Being the world traveler that he is, Brian was able to capture New Zealand’s Nigel Petrie and his insane Engineered To Slide (ETS) build first hand. 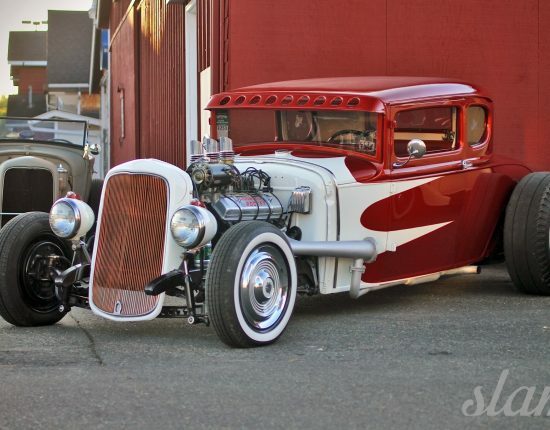 This naturally lit garage shot showing the air rams in action just screams badass and exemplifies just how much work went into this one-of-a-kind build. Nico is definitely one of our favorite camera jockeys due to his extreme flexibility and eye for detail. Although night shoots tend to be his trademark, like this graffiti wall shoot for Bernie’s (Dub Nation) MK6, Nico is also stellar at rolling shots (both rigged and non rigged) and continues to refine his craft. Stay tuned as we have some amazing shoots in store with Nico coming your way for 2015! 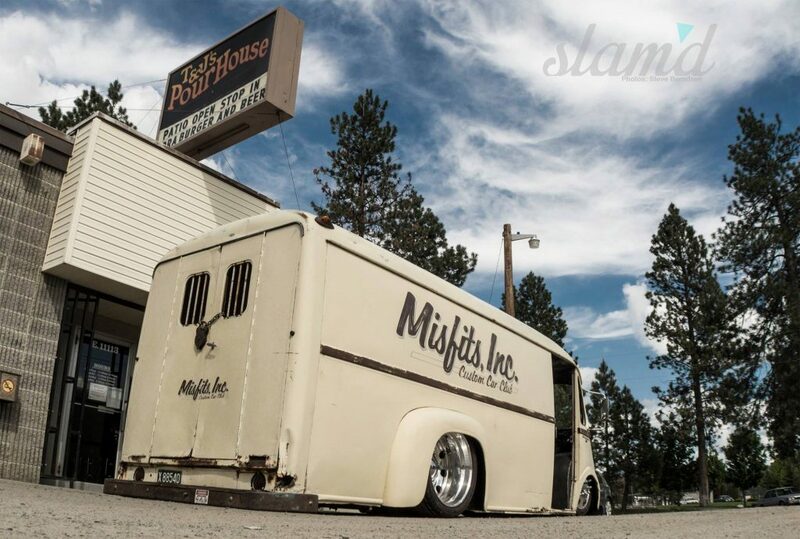 Ok ok, so yeah, we might just have a thing for rolling shots here at Slam’d! But what’s better than seeing these beautiful creations in action? 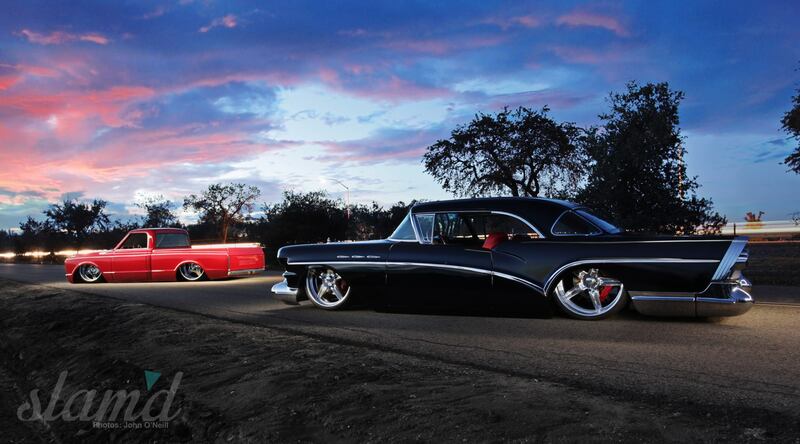 Not much, which is why we love this cruisin’ shot that Joshua captured of Russell’s classic Chev. The car mixes functional factory style with the “bomb” look and this image shows off all of the best traits proving that this bomb was built to drive! Another one of our favorite creatives behind the lens is Cody Gephart with his elegant and classy style that instantly leaves a mark. 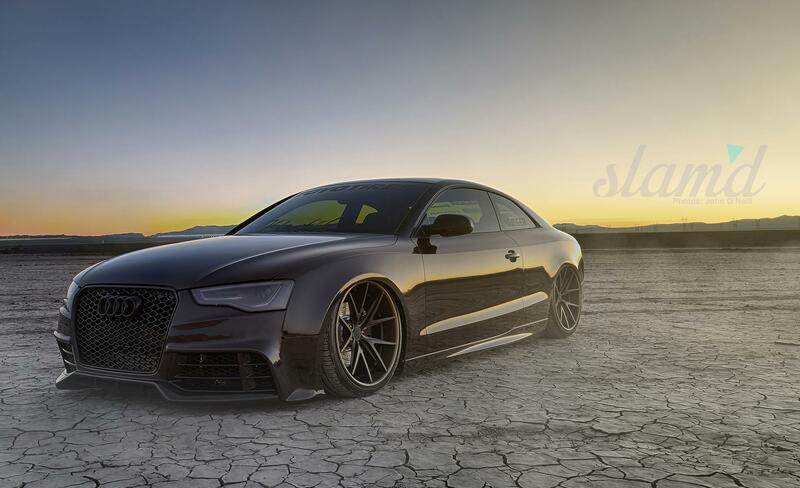 Cody is an Arizona native and shot Aaron Hunt’s Audi for the cover of Issue 03 in multiple locations to really capture the diversity of Aaron’s build. 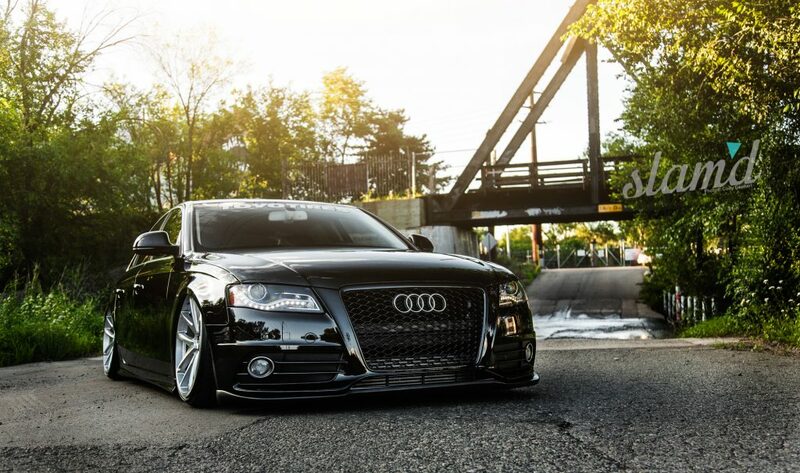 Shooting black is never easy, but Cody has perfected it, and this back lit shot out by the train tracks is a mixture of beauty and beast fitting the bill for the OCD LowForm Audi. A multi-talented camera wielder and designer, Koapono Patrick delivered these stunning images of perfection. 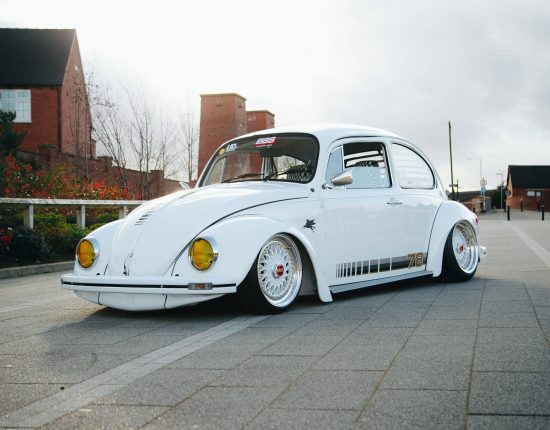 There aren’t many cars out there that we wouldn’t change a thing on, but this is one of them. Built by Curt Hall at Hall’s Hot Rods, Eric Livingston’s Cadillac is rolling art, and KP knocked it out of the park bringing it to life. 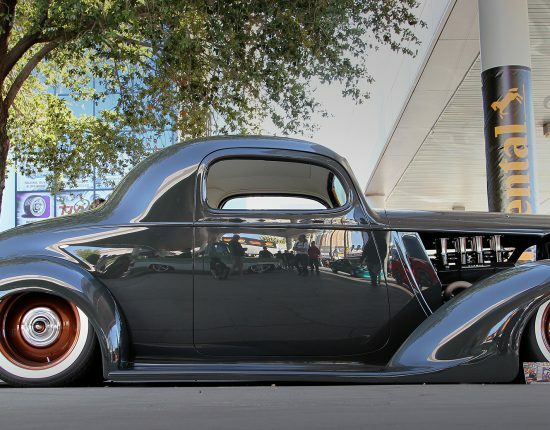 There’s not much that needs to be said to introduce Johnny O and his one-of-a-kind automotive art work. 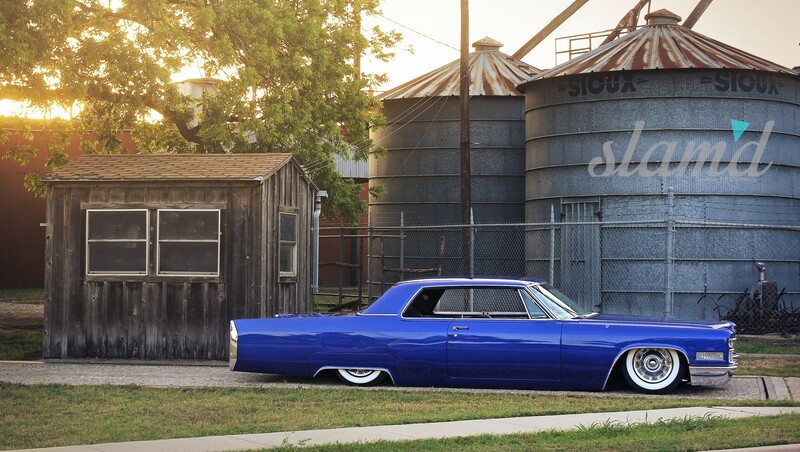 His photos tell the FULL story and are damn near as perfect as automotive photography gets. The style and diversity with which John shoots is probably one of the top reasons that he was chosen TWICE here in the Top 14 for 2014. We may be a bit bias, but there’s just something magical about taking a freshly completed SEMA debut vehicle out on location to the dry lake beds as the sun creeps up over the horizon and capturing the perfect image one click at a time. 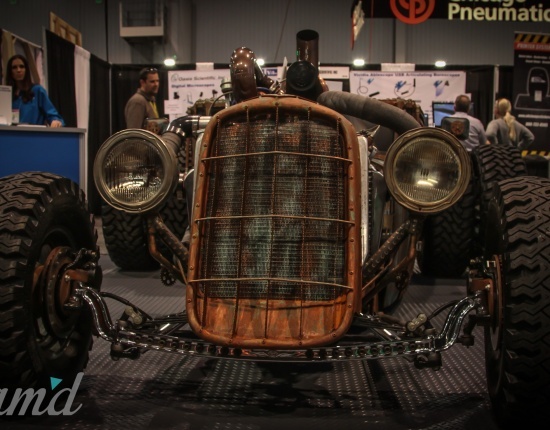 KEG Media brought out a winner for SEMA 2014 and John was able to capture it for our special SEMA Issue 04. As a vital part of the Slam’d team, we can’t wait to see what he has in store for us for 2015! The subject matter may be just as important as the shot, and there is something just SO right about these lit garage shots by James Cause. 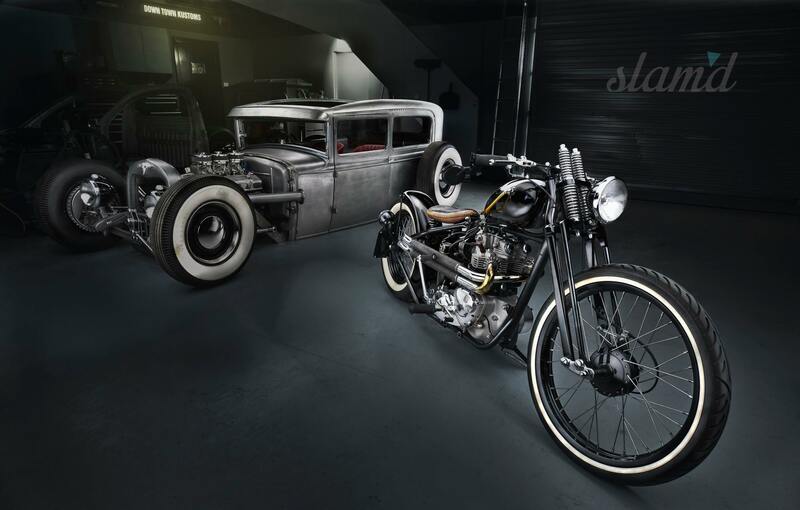 He visited Down Town Kustoms in New South Wales Australia and captured some of the coolest shop pics we’ve seen to date! Lighting is the key to all great photos, and although these have a bit of editing to them, they are still very natural in portraying the raw beauty that these classic machines project. Nicely done James, cheers! And last but definitely not least, our #1 photo in the Top 14 from 2014 goes to this amazing sunset shot by Johnny O, capturing two world-class builds in one killer image. It’s hard to describe the magic in John’s images but he has a way of picking the perfect location, mixing in the right light, subtle colors and edits, and composing a perfect shot with ever click. We have crowned this the TOP Slam’d Mag image from 2014, but other photographers and peers have called it the TOP Automotive Image across the board, and we’d have to agree. Join us in congratulating John O’neill, our Slam’d Photographer of the Year!